These products are approved by the FDA. The Selectrocide A12 generates 6 gallons of 500 ppm ultra-pure ClO₂ and is intended for applications that require large amounts of pure ClO₂ . The A12 is easy to use. Simply remove the sachet and place it in a covered tank or bucket and generate for 2 hours. Dilute the solution to fit your needs. The A12 is listed with the United States Food and Drug Administration as a food contact antimicrobial. The A12 is also recognized and registered with the Organic Materials Review Institute. 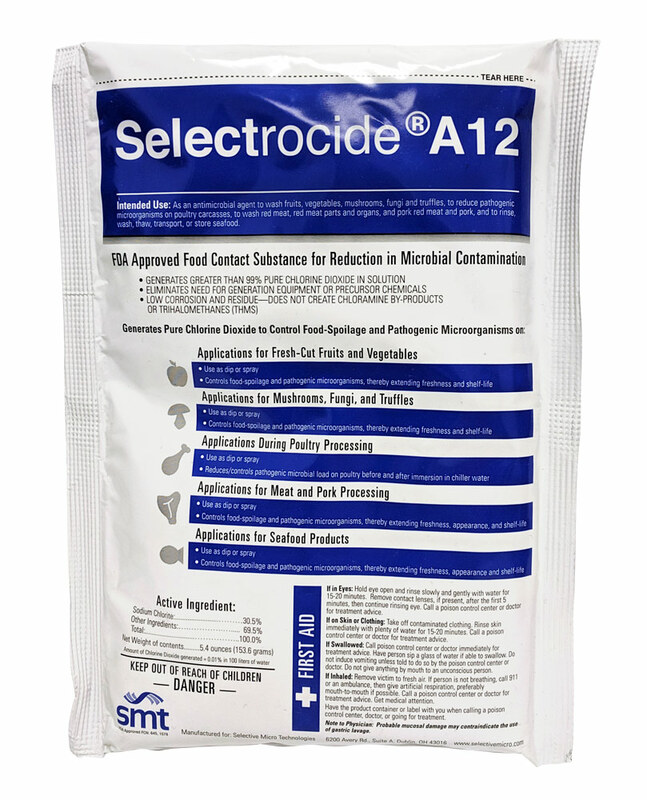 The A12 is commonly used in food processing facilities, or in groceries or restaurants. © 2018, Selective Micro Technologies, LLC. All rights reserved. Selective Micro, the Selectrocide name and logo, and the marketing molecules and logos are trademarks or registered trademarks of Selective Micro Technologies, LLC.